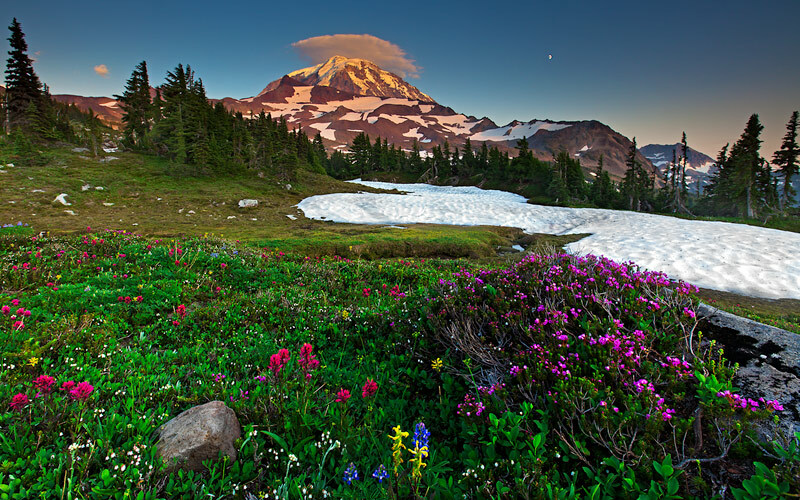 In the summertime, one of the most beautiful places in all of North America is Mount Rainier's Spray Park. A pristine meadow nestled at an elevation of 5400 ft. It typically features world class wildflowers along with in-your-face views of a false summit, called Liberty Cap (14,112 ft) Behind it, and out of sight, is the true summit recently measured at 14, 411 ft. For this image, I was drawn to this abundant grove of magenta indian paintbrush and other flowers located near a large, track of snow and rocks leading its way up the mountain, pictured here at sunset. Photo © copyright by Michael Greene.